Location of recent Bigfoot sightings. North East, Pa. — In what is being described as indisputable proof of the existence of Bigfoot, there have been repeated sightings in the small town of North East, Pennsylvania, but it’s not in a way you would suspect. The reclusive creature hasn’t been spotted in one of the many wooded areas in the region. Nor has he been seen in a fog shrouded field, or even lumbering across a quiet country road. 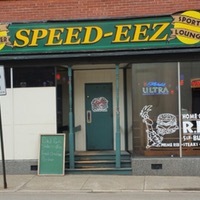 It seems Bigfoot has been spotted frequenting Speed’eez Sports Bar and Grill, a local establishment in the small town. 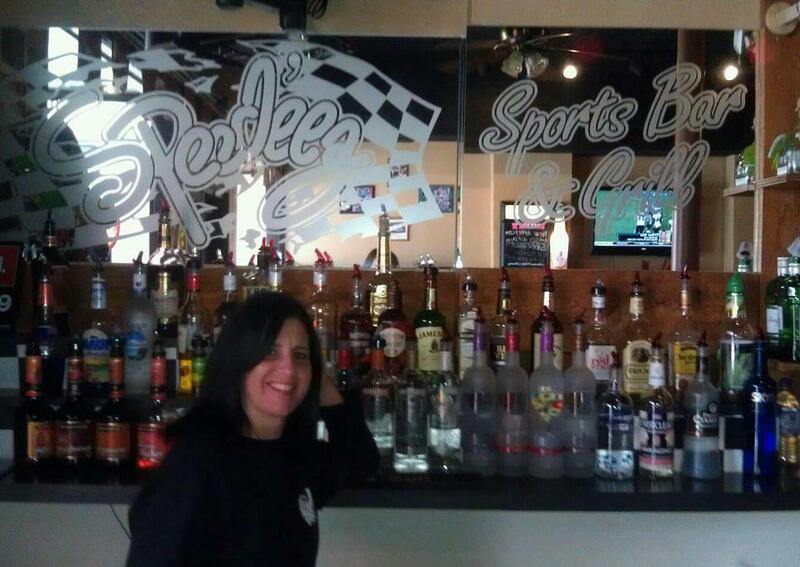 Jen, a bartender at Speed’eez Sports Bar and Grill, who has reportedly spotted Bigfoot…and served him Yuengling. While Bigfoot’s sudden appearances have caused quite a stir in the small community, not all of the patrons of Speed’eez are thrilled with the creature’s presence. Idiotprufs: This isn’t the type of setting people would expect to spot Bigfoot. Bigfoot: Yeah. Normally I like to stay a little more hidden: in a grove of trees or behind a big rock. Idiotprufs: So what brings you out? Bigfoot: Sometimes you just have to get out of the wilderness. It’s cold and wet out there and that’s where the family is. Idiotprufs: You need a little time away from the family? Bigfoot: Are you kidding? Bigfoot kids are hairy, messy, smelly, screaming little bastards. For the life of me I don’t know why those Bigfoot hunters can’t find me because there’s always a racket going on. Bigfoot: And there are bears out there. Idiotprufs: You don’t like bears? Bigfoot: Heavens no, they’re slow dimwitted creatures. You’ve heard the old saying about what bears do in the woods? It’s true, they do it all over the place, it’s disgusting. Ironically every time I try to take a leak, some idiot with a camera pops up out of nowhere. Idiotprufs: So you come here to relax? Bigfoot: Absolutely. And do you have any idea how hard it is to get food delivered to your home when your address is: Next To The Big Rock In The Woods. Idiotprufs: And the people here leave you alone? Bigfoot: Mostly they leave me alone. The people here are respectful, except for that idiot Poe… I don’t have chiggers! After the interview, I asked Bigfoot to pose for a few photos, to which he graciously agreed. Unfortunately they all turned out inexplicably blurred and out of frame. Artist’s rendition of Bigfoot running from an idiot with a camera. I live with one of his long lost cousins! And there is a scandalous amount of inbreeding in the Bigfoot community. That’s wise. Emotional instability is a hallmark of inbreeding. Now here’s a believable story to write about! lol..
It’s very disappointing to discover Sasquatch lied when he told me I was special. He obviously has many “Special” friends. Too late, damage is done. http://worldnewsdailyreport.com/colorado-hunter-claims-he-was-sexually-assaulted-by-a-sasquatch/ Here’s a good story! Your definition of good disturbs me. So does Bigfoot have some sort of weird effect on cameras that causes them to malfunction, or does he just not photograph well? Is he part vampire? If he’s part vampire, that would totally explain the photo thing… and the chiggers. I must be part vampire too. Big Foot lives in the Everglades whic starts about 40 miles west of me here in Miami. He is often seen surfing. Well at least trying to surf as a may just might get to 6 feet during a hurricane. Brilliant! I love a good fake interview. I’m actually thinking of visiting that bar in hopes of seeing Bigfoot. Also I love Yuengling and wings. Stop by, the big guy is a little unhappy right now though, he had money on Auburn. Poor Bigfoot. He’s so misunderstood. At least he drinks a quality lager. I KNEW that rumour about bears shitting in the woods was true. Poor Bigfoot, it must be a nightmare trying to avoid all that. He also has a tattoo of Snoopy.